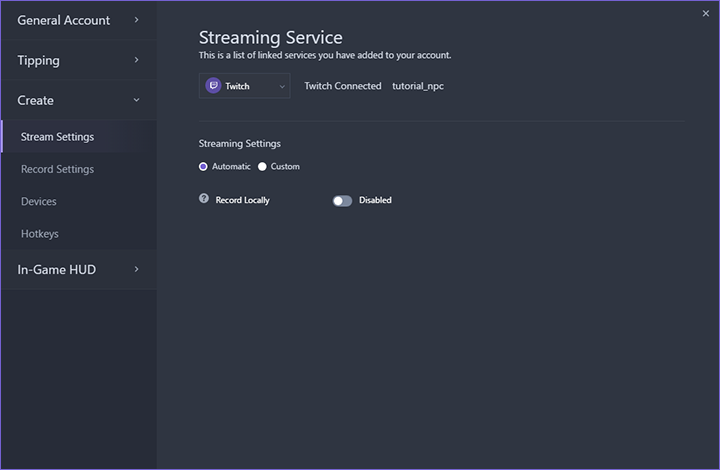 The Player App allows you to change the settings of how you stream or record. 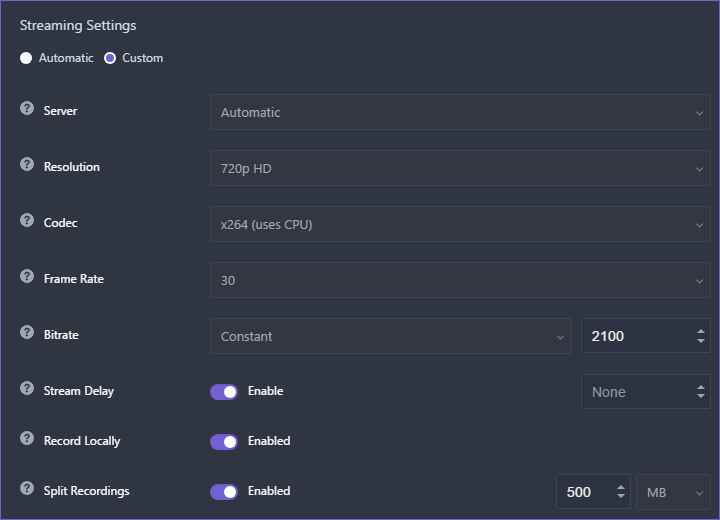 In automatic streaming mode, the Player Desktop App automatically determines which encoder to use and will select an appropriate resolution, frame rate and bitrate when you go live. Depending on your environment and your computer’s capabilities, automatic mode may change the default settings to best match your system. Record Locally - Enabling this allows you to save your live stream in the same location as your recordings folder, which in this case, can be found in the My Media page of the Desktop app. Custom streaming mode allows you to manually set a resolution and bitrate. Resolution - Allows you to select different stream resolutions for the Player Desktop App. The higher the resolution, the more upload bandwidth and CPU usage is required. Codec - Available codecs will depend on the PC’s hardware components. For live streaming, x264 is recommended for streaming. Frame Rate - Lets you set the framerate for your stream. The higher the frame rate, the higher the CPU usage. Bitrate - Describes the rate your data is transmitted in a given amount of time, measured in kilobits per second. Constant bitrate will always attempt to match the bitrate you’ve set. Stream Delay - Lets you set a delay for your stream, which is useful for hiding gameplay from opponents trying to get info by monitoring your stream. Record Locally - Allows you to save your live stream in the same locations as your recordings folder. Note this is a carbon copy of your stream and will only output an MP4 file. This feature is also available in automatic mode. Note: In this mode you may need to do a bit of experimenting to find the settings best suited for your setup. In automatic recording mode, the Player Desktop App automatically determines which encoder to use and will select an appropriate resolution, frame rate and bitrate when you start recording. Custom recording mode allows you to manually set a resolution and quality of recorded media files. Resolution - Allows you to select different resolutions for your recordings. The higher the resolution, the more upload bandwidth and CPU usage is required. Codec - Available codecs will depend on the PC’s hardware components. Frame Rate - Set the framerate of your recording. The higher the frame rate the higher the CPU usage. Quality - Allows you to select the visual quality of your recording between Standard, High, Very High, or Ultra High.